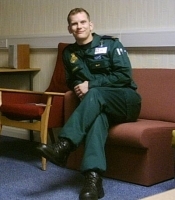 Hi there, I`m a 30 year old paramedic, from York (although I work in hull). I enjoy cooking, movies, having a drink and socialising. I never really know what to put on these things, so I`ll keep it brief lol. I like to think I have a friendly, outgoing personality, with an open view of life. I`ve seen the best (and worst) it can offer, and I`m still standing lol.